Stainless threaded Caps, usually liquid- or gas-tight, cover the otherwise open end of a pipe. 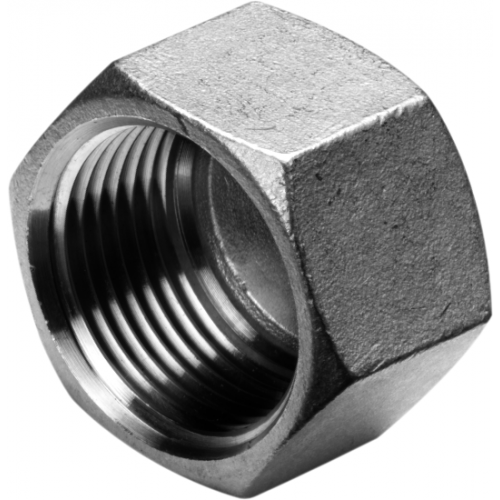 A stainless threaded cap attaches to the exterior of a pipe. The exterior of an industrial cap may be round, square, rectangular, U- or I-shaped, or may have a handgrip. Stainless Threaded Plugs or Caps are inserted into the end of a pipe to close it off. Stainless threaded Caps are screwed onto the end of a male threaded pipe to close it off and the threaded plugs are screwed onto the end of a female threaded pipe component. The stainless threaded plug fits inside the pipe segment or fitting. The main purpose of using stainless threaded pipe caps is to terminate some pipe connection. They are also used to close the the ends of hydraulic or pneumatic pipes and tubes if needed.